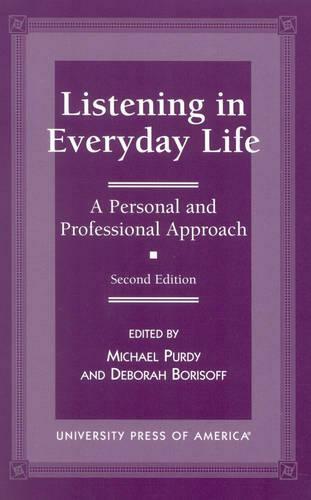 This book addresses the role listening plays in our personal and professional lives, and provides steps we can take to strengthen our own listening skills. Each chapter was written specifically for this book with the intention of introducing the reader to the major theories that affect the processes of listening, and to the impact of listening behavior on our own ability to be effective communicators. Contents: Forward, Ralph Nichols; Preface, Deborah Borisoff and Michael Purdy; Introduction: Why Listening? Deborah Borisoff and Michael Purdy; PART I: Processes and Contexts of Listening; What is Listening?, Michael Purdy; Intrapersonal and Interpersonal Listening: Self Listening and Conscious Action, Michael Purdy; Gender and Listening: Values Revalued, Deborah Borisoff and Dan Hahn; Intercultural Listening, Dean Thomlison; Managing Interpersonal and Team Conflict: Listening Strategies, Patrice Johnson, and Kittie Watson; The New Digital Presence: Listening, Access, and Computer-Mediated Life, Rob Anderson; Listening as an Indiscreet Public Act or Eavesdropping Can Be Fun, Gary Gumpert and Susan J. Drucker; PART II: Listening in the Professions; Listening in the Educational Environment, Carolyn Coakley and Andrew Wolvin; Listening Training: The Key to Success in Today's Organizations, Lyman K. Steil; Listening in the Service Industries: It Makes Good Cents, Judi Brownell; Listening and the Helping Professions, William Arnold; The Lawyer-Client Encounter: Listening for Facts and Relationship, David A. Victor and Cindy Rhodes Victor; Listening: A Crucial Competency for Effective Health Care Delivery, Gary Krepd, Ellen Bonaguro, and Jim Query; Listening in Journalism: All the News We've Heard About That's Fit to Print, Rob Anderson and Mike Killenberg; PART III: Conclusion; Steps to Strengthen Listening Ability, Deborah Borisoff and Michael Purdy; About the Contributors.